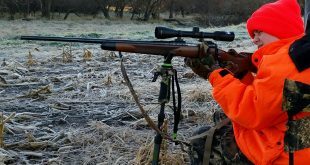 For many reading this the spring turkey season may not really get underway until early this Saturday morning – the opener of the regular shotgun season. For me the season kicked off last month when I could begin chasing the birds with my bow and then got really interesting this past weekend. I have yet to take a gobbler but already I am harvesting memories of this spring’s crop of first’s. In the past few years my brother, Gabriel, has sampled the turkey hunting we enjoy in Nebraska with some quick weekend hunts with a shotgun. His move to the state this past winter has now given him the opportunity to see what the early archery season is all about. 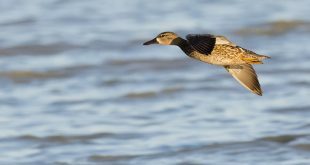 Since the March 25 opener he has been able to spend a handful of hunts in the field and has already been around more birds than he would have hunting his former state in a full season. On just his third hunt he tagged his first ever gobbler with a bow. To help him avoid embarrassment I will not mention the broad-head shaped hole in his new ground blind. I have been blessed to be a part of many first hunts and more than a few first turkey kills. However, the opening of the youth shotgun season this past weekend took on a whole different flavor as our eldest, 9-year old Logan, hit the woods with a 20 gauge. Logan is no stranger to the spring woods. He was three when he first accompanied me to the blind where he learned what a turkey alarm putt sounded like. At age 5 Logan called in a gobbler for me. Last couple of years he may have logged more time in the turkey woods than most hunters thanks to his time with both me and his mom. But this isn’t quite the same as being the predator. 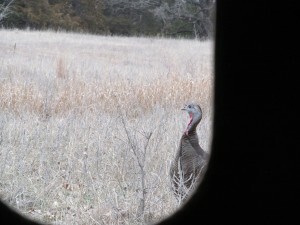 He learned this on Saturday morning when two big toms made their way to our decoys from the field behind us. Logan’s shallow breathing proved his excitement – mine, too. With the birds at 15 yards some needed adjustments were made which got all of us involved a bit more nervous. This was a likely reason for his shot being sent right over the top of the lead tom’s head. The unscathed duo gobbled at the report and promptly left the field. Logan was riding both the adrenaline high of being so close to two magnificent birds as well as the depressing low of a clean miss. He is becoming a true turkey predator. The next morning found five of us in two different blinds. The warm, calm night had the birds booming from all directions and ready for love. Logan and I tried our best but found most of the birds wanting to be someplace other than where we were. 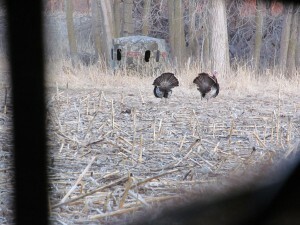 We called a pair of hens to within a couple feet of the blind, but no gobbler was to be lured into range. We did get to watch a pair of jakes and four hens in the distance that ended up in front of a blind being occupied by my wife Leslie, daughter Emma and Gabriel. The birds passed within a few yards of their blind, splitting through their 3 decoys. After loosing an arrow Leslie texted me “…bounced an arrow of ones back”. 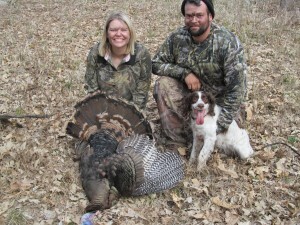 Actually it was a clean pass-thru and about an hour later, thanks to springer spaniel Paige, Leslie was having her picture taken with her first turkey with a bow. Ladies and gentlemen we have some special turkey hunting opportunities in Nebraska. Turkey season is not even 3 weeks old as I type this, and I cannot wait to see what the final 7+ weeks have in store for us silly enough to chase the gobbling bird of spring.